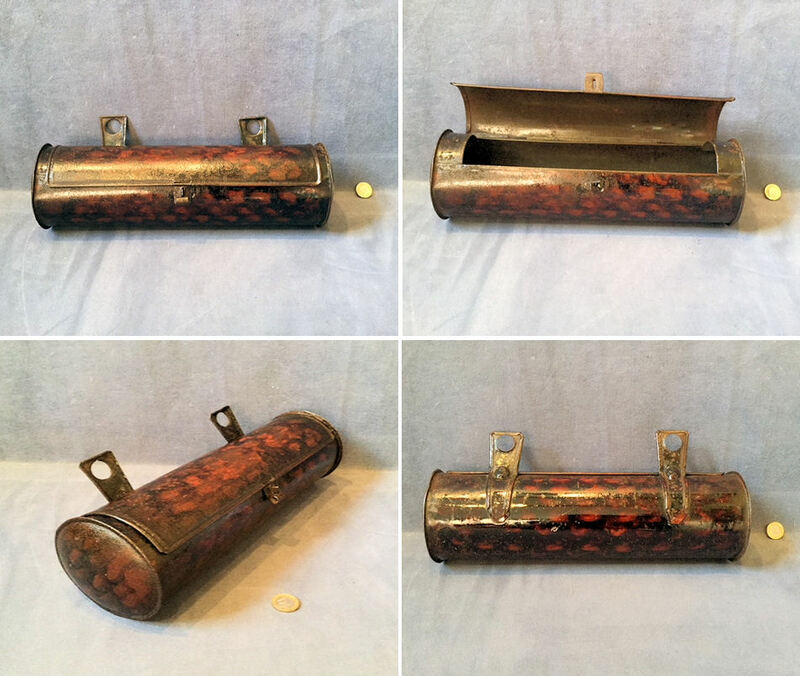 Original, quality mid to late 19th century cylindrical wall mounted tin candle storage tube with a hinged flap lid and hasp, two wall mounting plates and the original decorated finish. One small hole to the lid, otherwise complete and in super condition. 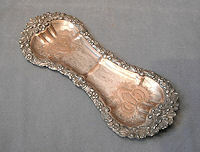 14.5" long, body 4.25" diam and 6" tall including mounting plates. 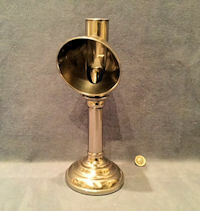 Original, quality 1920's nickel plated reading lamp with a lift off reflector hood, a sprung feed candle and an extending height to the main stem. All has been polished and lacquered, although the lacquer may be removed at no extra cost and has minor dents to the base otherwise complete and in good and working order. 12" tall down and 16.75" extended. Base 4" diam and hood front 4" diam. 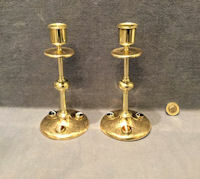 Original, quality late 19th century engraved brass candlesticks set with agate carbachons. The circular bases each have three agates and engraved designs of fern leaves and flowers and the drip pans again are engraved with more simple detail. 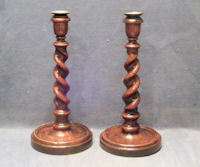 This pair of candlesticks would probably have been part of a desk writing set to include perhaps an inkwell, blotter, stationery box and even a postal scale. All has been polished and lacquered, although the lacquer may be removed at no extra cost and is complete and in good and working order. 6.5" tall and base 3.25" diameter. 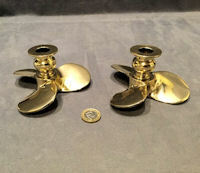 Original, quality pair of post-war cast brass boat propeller blades fitted with a pair of cast brass candle holders made to suit. Polished and lacquered, although the lacquer may be removed at no extra cost and complete and in good order. 2.5" tall and 5" diam. 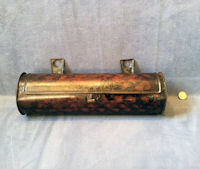 Original, quality circa 1900, nickel plated chamberstick with a side grip, the original drip pan and snuffer, all in near mint condition. The octagonal tray has acanthus leaf decorations to each corner and all has been polished and lacquered, although the lacquer may be removed at no extra cost. Complete and in good and working order. Base 6.5" widest and 4" tall. Clock on photo for larger and other views. Original, quality pair of late 19th century open twist mahogany candlesticks with weighted circular bases and the original brass drip pans. This superb pair have matching left and right handed twisting stems, what a skill turning these on an ornamental lathe and these will unscrew from the bases to make travelling with them easier. Complete and in good and working order. Base 6" diam and total height 14". 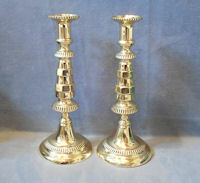 Original, quality pair of 1920's 12.5" tall brass candlesticks, impressed to the base "The King of Diamonds". This super pair have the original candle push rod ejectors and are complete and in good and working order and all has been polished and lacquered, although the lacquer may be removed at no extra cost. 12.5" tall and 5.25" widest at base. 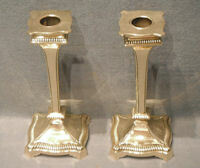 Original, quality pair of brass and copper candle holders in a serious Arts and Crafts form circa 1900 / 1920's. 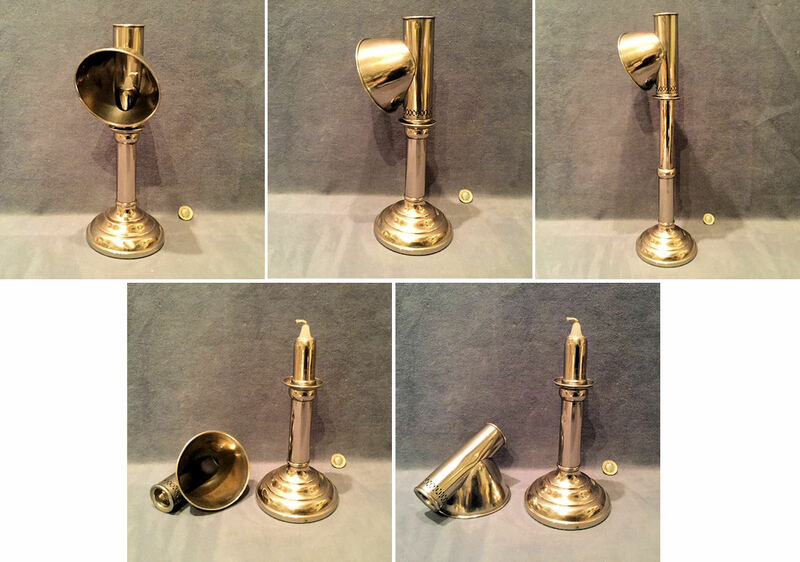 These examples have a ribbed conical base in copper, a central brass stem with a side handle of brass and ebony and a brass candle holder to the top with a petal shaped copper drip pan. The undersides have concealed cast iron weights for stability and one is stamped with the registration number for the year 1896. All has been polished and lacquered, although the lacquer may be removed at no extra cost and are complete and in good and working order. 5" tall and base 2.75" diam. Original, quality pair of 18th century or early 19th century brass candlesticks with seamed stems and petal shaped cast brass bases. 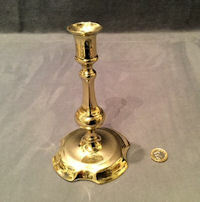 Pairs of seamed candlesticks are still difficult to find today and these are in super condition. Complete and in good and working order. 8.25" tall and 4.5" base diam. 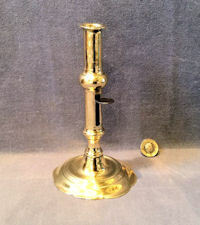 Original, quality 18th century single brass candlestick with a shaped base and a seamed and shaped stem. Polished and lacquered, although the lacquer may be removed at no extra cost and complete and in good and working order. 6.75" tall and 4.25" base diam. Original, quality late 19th century pair of cast brass candlesticks of an unusual form, with pierced decoration of flowers, vines, acanthus leaves and faces of a bearded mythical character. The lift out sconces to the top are impressed "Protected" and the undersides of the candlestick bases are impressed with the sun logo and "WT&S" for the manufacturer 'William Tonks & Son of Birmingham' and with the registration number for the year 1888. All has been polished and lacquered, although the lacquer may be removed at no extra cost and are complete and in good and working order. 10.5" tall and base 5.75" diam including feet. Original, quality circa 1900 / 1920's single moulded vaseline coloured glass candlestick, probably part of a dressing table set but of a super colour and condition, not a chip in sight. 8" tall and 4" diam base. 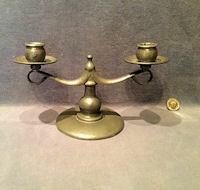 Original, quality 1920's twin branch pewter candelabra of an Art and Crafts form with a circular plinth. The underside is impressed "6 Tudric. English Pewter Liberty & Co 01747". A minor dent to the rim of the plinth otherwise all is complete and in good and working order. 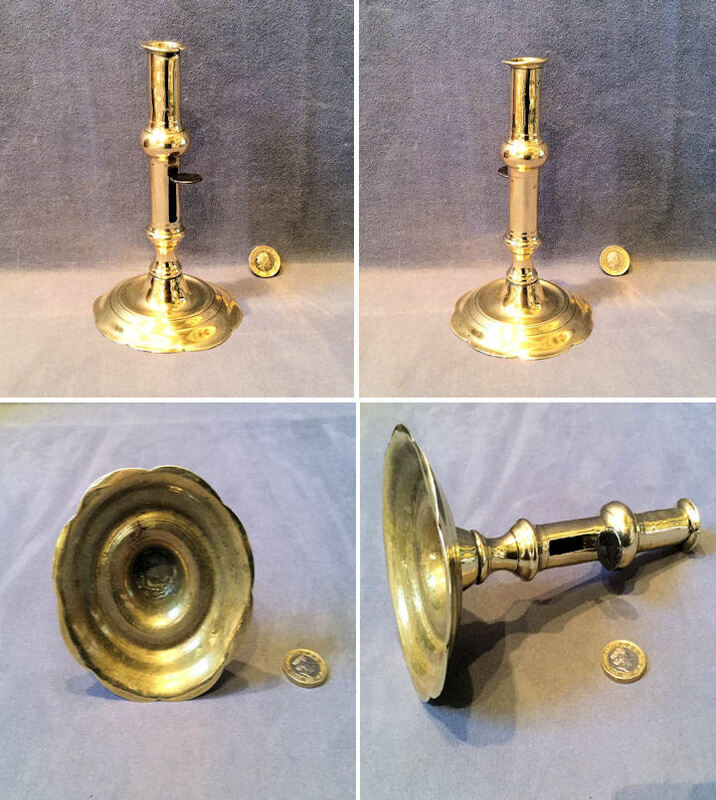 Original, quality 18th century single brass candlestick with a petal shaped base, a shaped stem with a wrought iron slide up candle ejector and a seamed central stem. Polished and lacquered, although the lacquer may be removed at no extra cost. Some old damage to the top rim. Otherwise in good and working order. 7" tall and 4" base diam. 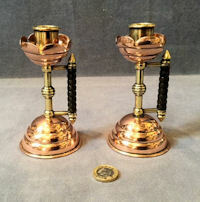 Original, quality pair of late 19th century pink brass candlesticks with square bases, tapered stems with knops and engraved bands to the top knops. A most unusual pair of candlesticks. Polished and lacquered, although the lacquer may be removed at no extra cost and complete and in good and working order. 10.5" tall and 3.5" square base. 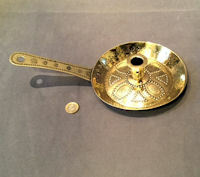 Original, quality late 19th century brass chamber stick with a circular pan with a candle holder to the centre and a side handle for carrying. All is decorated with punch engraved patterns and the candle holder has a hole to the side to enable the candle stub to be removed. The upper surface has been polished and lacquered, although the lacquer may be removed at no extra cost and the underside has retained a super patina and colour. Complete and in good order. Pan 6.5" diam and 1" tall. Total 12" x 6.5" and 2.5" tall. 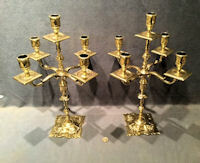 Original, quality pair of five branch cast brass candelabras circa 1900, in the 18th century style. The bases are as single candlesticks with a double layered plinth and shaped stems and would work as a pair of single candlesticks. The upper five candle sconces are set as four level branches each with one candle holder and one central to match but taller. Each of the five sconces have the original square brass drip pans, the upper central stem matches the lower stem beneath, and the top cluster of five will lift off if required. Some good repairs and now all complete and in good and working order and polished and lacquered, although the lacquer may be removed at no extra cost. A most unusual pair of candelabras. 18" tall, 12" widest and bases 5" square. Single sticks 8.5" tall. 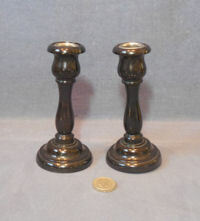 Original, quality pair of 1920's turned ebony candlesticks with the original nickel inserts to the top. These super sticks will dismantle for storing in a suitcase when travelling and the undersides are stamped "Real Ebony". Some minor splits to the upper section otherwise complete and in good and working order. Base 2.25" diam and 5" tall. 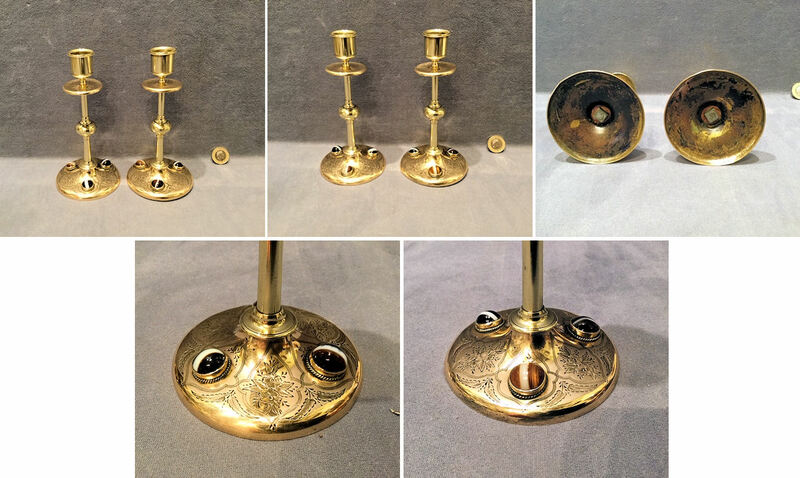 Original, quality pair of late 19th century cast brass candlesticks, with circular bases, shaped stems and the original push rod candle ejectors. Polished and lacquered, although the lacquer may be removed at no extra cost. Some minor nicks to the top rim on one stick otherwise complete and in good and working order. 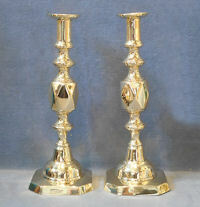 A super pair of candlesticks. 11.5" tall and 5.25"diam of base. 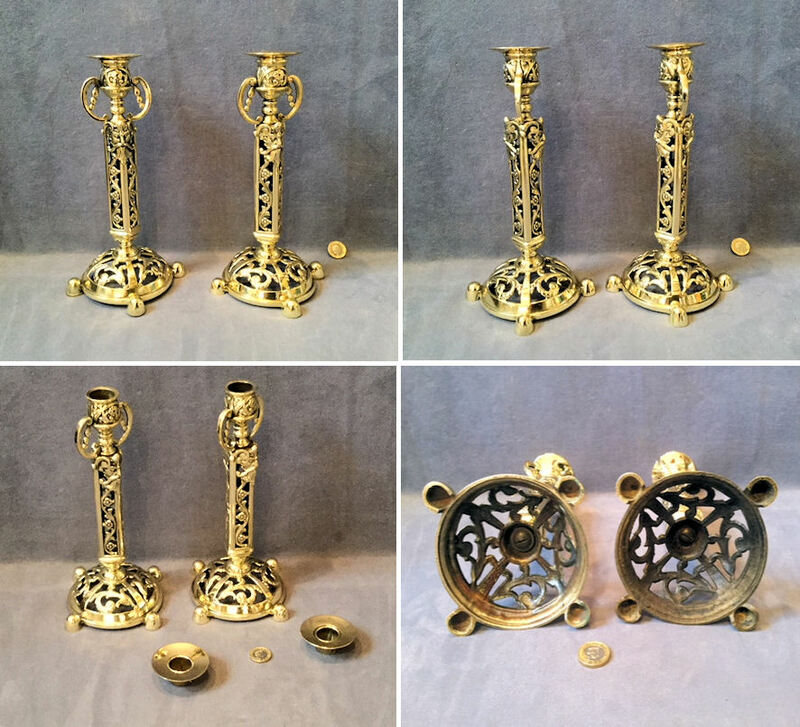 Pair of original, quality, heavy cast brass candlesticks of a most unusual form, with lift out sconces and cast iron shaped weights to the undersides. 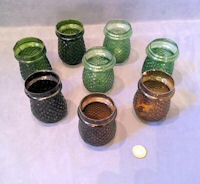 Each has a square base with serpentine sides and a square tapered stem and a square collar to the top. The sconces are stamped "Protected" and of the same shape as the bases. 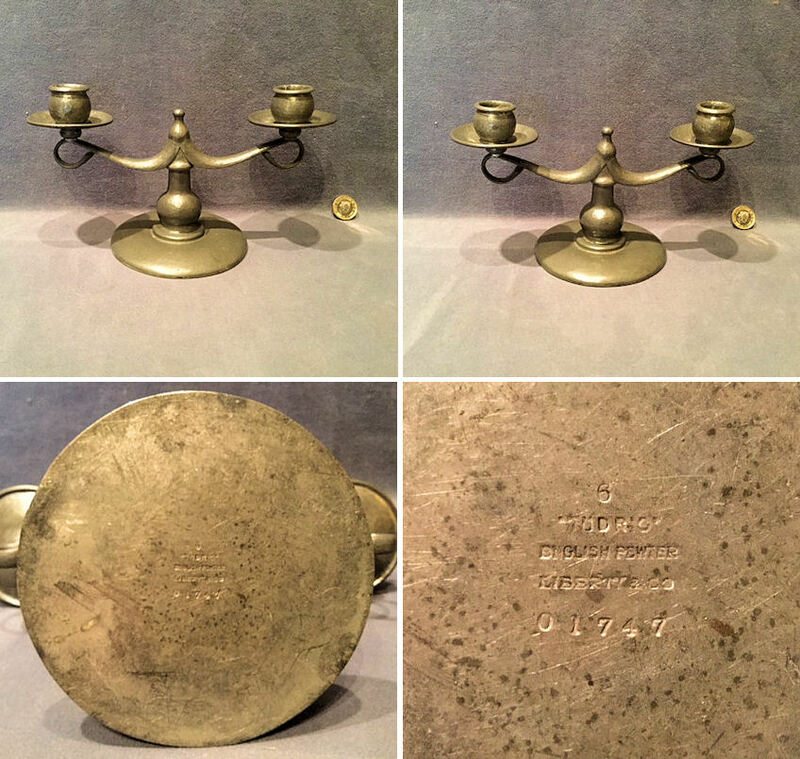 The weights to the undersides are impressed with the sun logo and" WT&S" for the manufacturer 'William Tonks & Son, of Birmingham' and have the registration number for the year 1902. 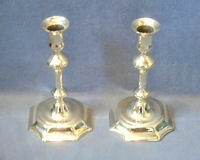 The undersides have the original gold paint and the candlesticks have been polished and lacquered, although the lacquer may be removed at no extra cost. Complete and in good order. 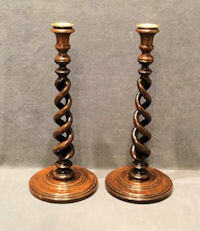 A great pair of candlesticks by this great maker. Bases 3" square x 7" tall. 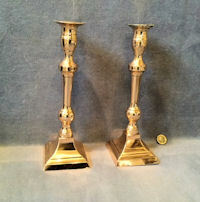 Pair of original, quality, late 19th century, cast brass candlesticks with square bases and canted corners and shaped stems. This pair of candlesticks are complete with the push ejector rods for the candles and are impressed to the plinth "The Queen of Diamonds". All has been polished and lacquered, although the lacquer may be removed at no extra cost and are complete and in good and working order. 11.5" tall x 4.5" square bases. 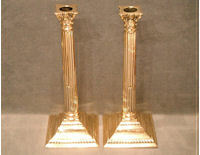 Pair of original, quality, superb, 18th century, seamed brass candllesticks with shaped square bases with canted corners. 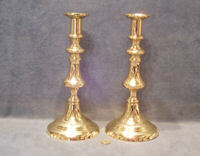 A very clean pair of early brass candlesticks, complete and in good and working order. 7" tall x 4" square bases. 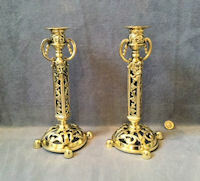 Pair of original, quality, late 19th century, cast brass candlesticks of an unusual form. These 12" examples have circular bases, crimped designs to the circumferences in four places and good complete push ejector rods for the candles. Polished and lacquered, although the lacquer may be removed at no extra cost, complete and in good and working order. Bases 5" diameter, total height 12". 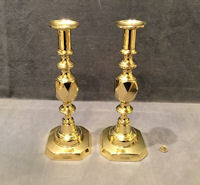 Pair of original, quality, 18th century, cast brass candlesticks of a tapered, corinthian column form, with decorative capitols and stepped square bases. The main columns have visible seams to the sides and the bases are engraved in script "The Friendly Brothers of The Prince of Wales Society". The top candle sconces are missing, but otherwise all is complete and in good order and most unusual with the engraved inscription. Polished and lacquered, although the lacquer may be removed at no extra cost. Bases 5" square and 12.25" tall. Original, quality 'Lancaster Patent' dark room 'candle' ruby lamp in original paintwork on steel circa 1880. Will fold down flat when not in use. Complete and in good and working order. 7.25" tall. 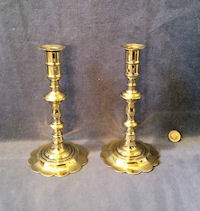 Pair of original, quality cast brass, 10.75" high candle sticks, on square plinths with canted corners, complete with push rod candle ejecters. Impressed to the plinth 'The Diamond Princess' and with the registration number for the year 1902. Polished and lacquered, although the lacquer may be removed at no extra cost. Complete and in good order. 10.75" tall and base 4" square. 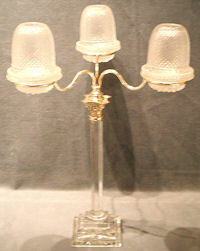 Original, quality, superb three branch candelabra, circa 1900, with an octagonal shaped cut glass column, a square and stepped base and mounted to the top with a cast brass corinthian capital. The three curved brass branches each with rings to the ends, support pressed glass saucers, with pressed glass domes or the alternative fine glass shades / chimneys. These lights are used with small nightlight candles. The brass ring holders are stamped "Clarke's Trade Mark Cricklite" to the inside. The corinthian capital is stamped "Clarke's Cricklite". The pressed glass saucers are embossed to the insides "Clarke's Patent Trade Mark Cricklite " with a dancing fairy to the centre and the alternative fine chimneys are mounted with pressed brass collars to the bases in the original matt gilt finish. Either but not both sets of chimneys or dome covers are included with the candelabra. A few very, very, minor chips to the column base, otherwise all is complete and in good and working order. Base 4.25" square, 16" tall including saucers, 15" widest diameter and height including domes 19.5, height including chimneys 20.5". 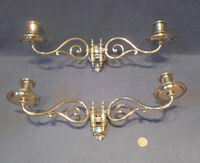 Pair of late 19th century, twin branch wall mounted candle sconces with provision for four candles. These were originally from a wall mirror or even a very smart piano, but are now ideal for wall lights, but for candles only. 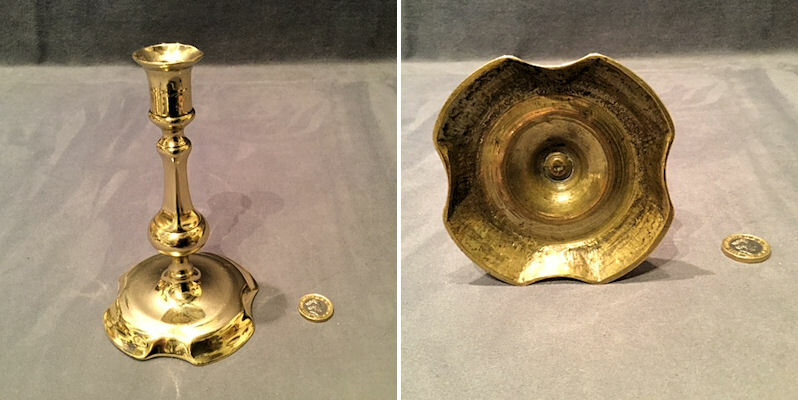 The decorative cast brass arms push into the cast brass backplates, each with two screw holes for mounting, each candle holder has a circular and dished drip pan and each fitting has a stop to prevent the candle being pushed back to the wall. All has been polished and lacquered, although the lacquer may be removed at no extra cost and is complete and in good and working order. A super pair of candle sconces well above average. When mounted widest 15.5", 4.5" front to back, max front to back mounted 8.75" x 5.5" tall.